Dassia is placed along the North-East coast of Corfu island, just between two very big tourist villages: Gouvia to the South and Ipsos to the North. 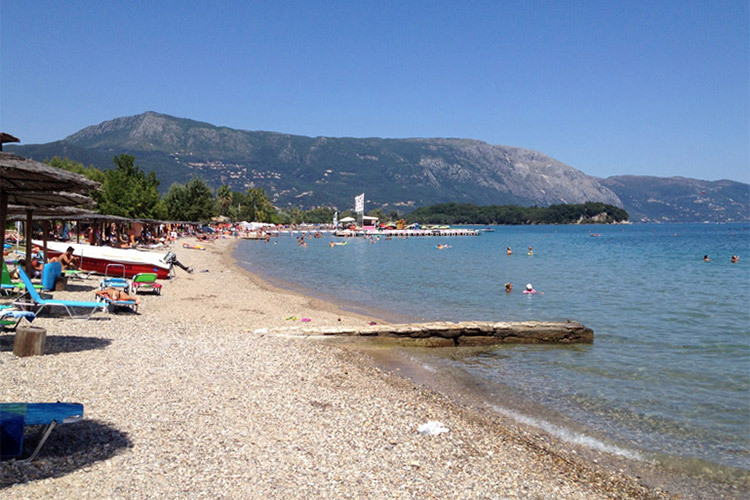 Also Dasia is a village full of tourist facilities both for the services that it offers and for the choice of accommodation as hotels and self catering apartments. This village is mainly for young people who want to enjoy themselves in disco clubs during the night and relax on the beach playing water sports during the day. Dasiais not very big, but for its strategic position is a good place where to start to discover the island and the hinterland traditional villages. In the town you can also find sport activities that have nothing to do with the sea as for example horse riding and golf course. 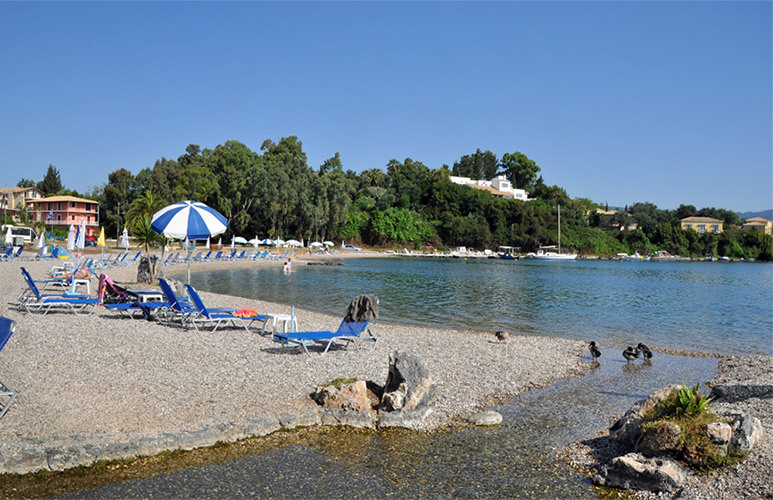 Very close to Corfu town, Gouvia appears like a small and modern village well equipped to satisfy any need of the tourist. Gouvia is developed along the coast road and offers several restaurants, traditional places and disco clubs that are open till late in the night. Near Gouvia, between the port and the beach, you can also find some ancient Venetian ruins. This beach of Dassia both of stones and sand is not very wide but very long and well equipped with beach umbrellas and deck chairs. Here you’ll have also the opportunity to play many water sports and the parachuting. The sea along this part of the coast is very calm and not very deep and there’s a sort of platform where you can go to dive from. There are also motor boats for rent to discover the nearby bay and the view over Albanian mountains is really stunning. The beach of Gouvia is made of both sand and stones, it’s small but full of tourist facilities like water sports, boat tours and the possibility to rent beach umbrellas and deck chairs. From the beach you can have also a nice view over the bay and the little church of Ipapandi. 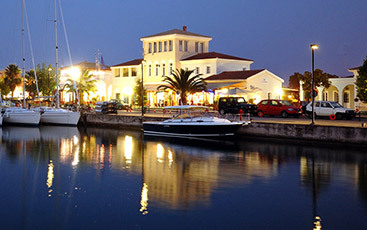 In addition, Gouvia has a large and well equipped port called Gouvia Marina. Dassia and Gouvia are well connected with Corfu town and the nearby villages like Ipsos by the local bus service that offers several runs every day. Providing the best services on the island, we assure that you rent the safest, newest and most reliable car at the best price. In Dassia and Gouvia you can find many kinds of shops like supermarkets, souvenir shops and everything else you can need. During the evening, after a good dinner in a traditional restaurant or in a fast food, you can have a drink in a cocktail bar or decide to dance in a disco club till the morning. In this Greek tavern the traditional environment combined with a warm family welcome will permit you to have a relaxing evening and an unforgettable meal. Dassia and Gouvia are tourist village that offers different kinds of solutions for your stay. You can choose between apartments, hotels, studios to suit every pocket. Green Corner Apartments are close to a lot of amenities, but they will guarantee you a peaceful and relaxing stay as our accommodation are surrounded by 12.000 sq. m. of private garden. In Dionysus camping you can find many facilities as an Olympic size swimming pool, internet, fax, washing machines, ironing facilities, super-market, cocktail bar, a common area with cooking facilities or, if you prefer, a traditional restaurant. Marilena Apartments are placed in Dassia and are constituted of 2 different residence: MARILENA STUDIOS and SPITI PROKOPIS. We offer studios for 2/3 persons and apartments from 2 to 7 persons at only 20 m from the beach.